How do you know when someone is beginning their dying process? Teaching English to Tibetan monks is one thing, but to see the Dalai Lama in person is quite another. 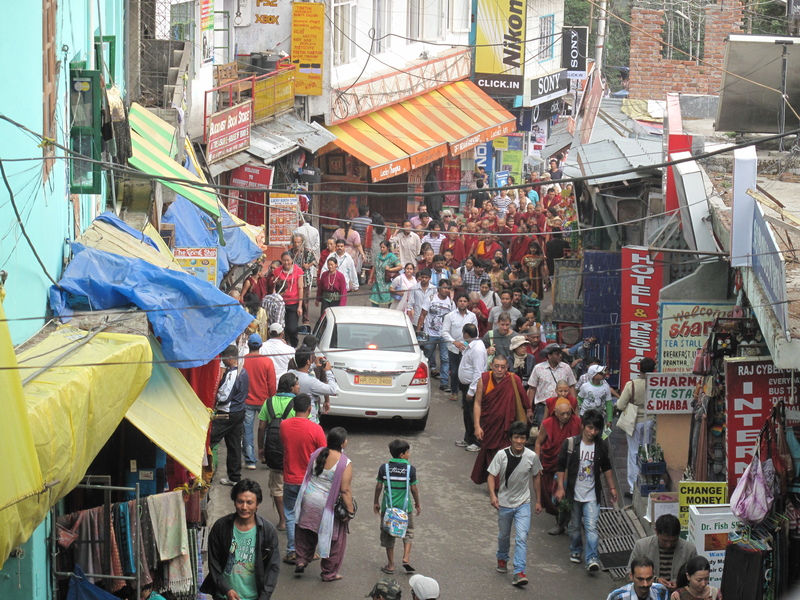 From Thursday to Saturday here in Dharamsala, he has been holding twice-daily open audiences at the Temple. As 6,000 people are expected at each session, I was thrilled when Kunchok, a senior monk who runs the English teaching programme at the Temple, showed me a special area set aside for guests of the Temple office. This included those of us who teach English to the monks. 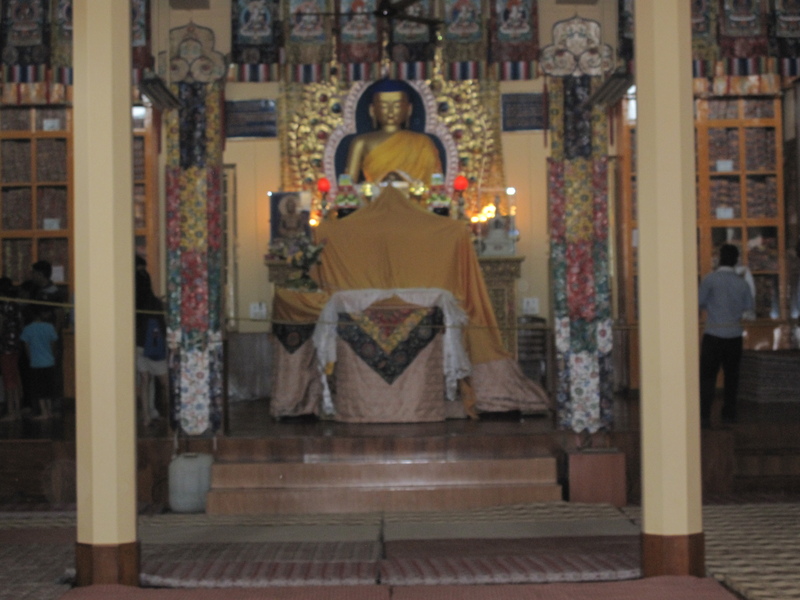 The area is outside the Temple itself, beside a large open widow promising a great view of his Holiness. 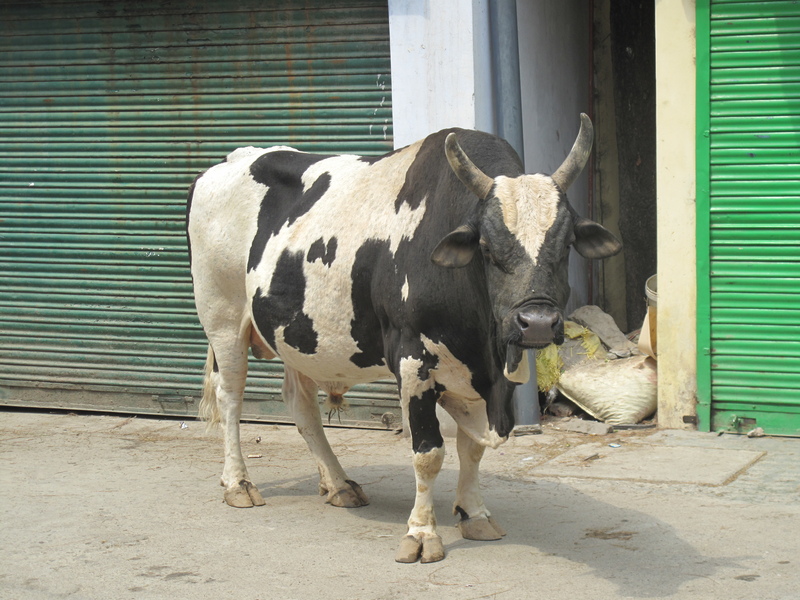 Early Thursday morning I walked briskly down Temple Road with Payma’s breakfast in my backpack, accompanied by the local bull and the gravelly chants of a elderly Tibetan woman in traditional dress, no more than four-foot-six high. 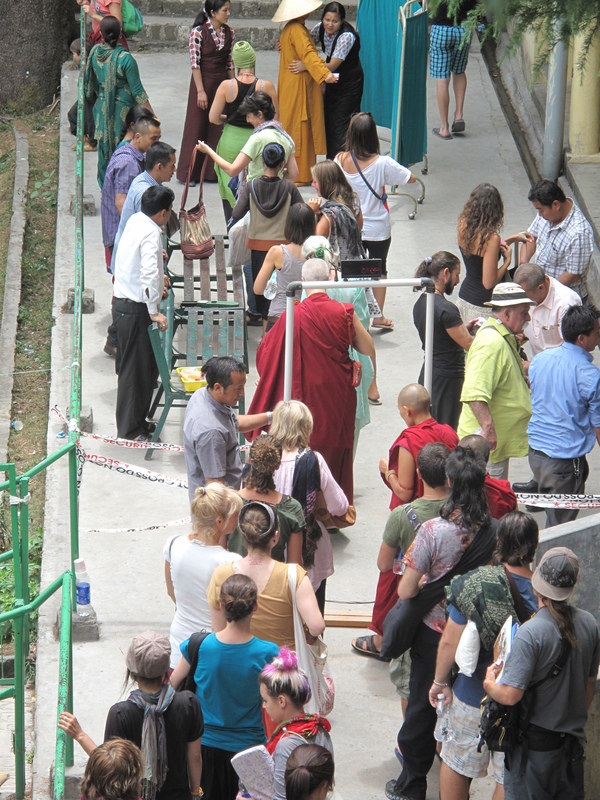 By the time I arrived, the entrance to the Temple complex was already teeming with Dalai Lama followers. Due to recent poison plot scares, security was extremely tight. I was directed towards the westerners’ gate, where I was given a rigorous going-over including full body scan, a hair-check, and asked to drink from my water bottle in case I’d laced it with a fatal substance. Anyone with a mobile phone or camera is immediately turned away. Once cleared, I made my way upstairs to the special area beside the Temple window, filled with grubby mattresses (everyone in the Temple sits on mattresses). But, the burly security guards were having none of it. Kunchok had not given me the necessary office pass, so I had to move. After futile attempts to argue with them, I stomped off to find a space somewhere else. That’s when I saw Gesu and Zirogoo, my Tibetan students, waving enthusiastically. They had secured a great view on a small raised step about twenty feet from the open Temple doors. I settled in beside them and had my breakfast. Kunchok arrived, full of apologies and beckoning me to follow him back to the special area. I complied and, feeling rather smug, sat down next to Jo, another IVHQ teacher. Triumph was short-lived. Another Temple official appeared, demanding to see our office passes. I looked helplessly round for Kunchok. He had disappeared, which meant being expelled yet again. Leaving Jo to try to sort things out, I tramped back to Gesu and Zorikoo. All went well until an aging Tibetan woman limped towards us on a wooden stick, clearly upset. We learnt she had apparently ‘reserved’ the places where we were sitting two days previously by putting down her own cushions (be aware of this if you ever go to one of the Dalai Lama’s teaching sessions). I was about to give way (after all, Buddhism is about compassion and non-attachment, and I was about to be in the presence of His Holiness), but Gesu and Zirikoo were made of sterner stuff. They had checked with the security guards when they arrived at 6.00 am. Anyone could sit here. There ensued a massive argument, fuelled by a younger Tibetan woman who had marked her territory with a huge, heavy handbag, and a middle-aged American hippy (obviously an old hand at unofficial Temple protocol) so patronising that I had to stop myself from taking a swing at him. Finally, Gesu summoned a security guard to arbitrate. The security guard (almighty in the Temple; some carry machine guns) waved away the old woman’s claims, so we all budged up and she grumpily squeezed in beside us. Jo also arrived – she hadn’t stood a chance – so we all shuffled up again. 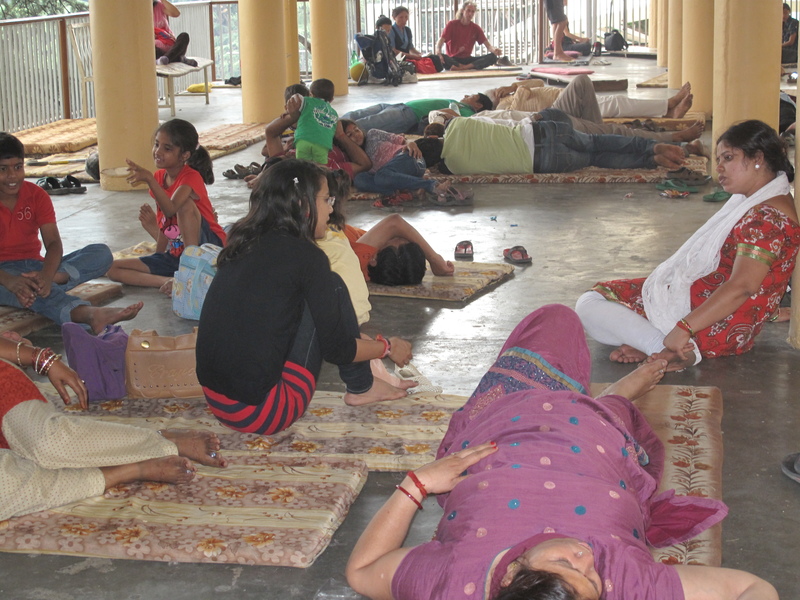 Over the next half hour, I watched as a crush of devotees claimed and occupied every last square inch of the mattresses that covered the Temple floor, and then, lo! and behold, Kunchok returned, asking Jo and me to write down our names. Within minutes, he was back again wreathed in smiles, and with the blessing of the Temple office now secured, told us we could claim our seats in the special area. Extremely sceptical by now – but with my karma reinforced by the practise of such restraint with the American hippy – Jo and I were ushered to the front where, for the next two hours, cheek -by-jowl with a host of other guests and watched over by the ever-vigilant security guards, we did indeed have a wonderful view of the Dalai Lama, enjoying his infectious giggle and listening to the English interpretation of his teaching on radios tuned to a dedicated FM frequency. Even though my hips and back ached afterwards from sitting in such a confined space, it was a wonderfully memorable experience – and a reminder that no matter how well-intentioned we might be, or how spiritually advanced we might think we are, when it comes to claiming personal space, the darker side of human nature will have its way. It was a challenging and humbling teaching to take home with me. This entry was posted in About Sue, All posts and tagged Dalai Lama, Dalai Lama Temple, International Volunteer Headquarters, IVHQ, McLeod Ganj. Bookmark the permalink. Everybody knows you can’t keep a good woman down. My, you are persistent ! Can I touch your scarf when you get back? Finally caught up with your blogs, Sue, it’s wonderful reading. You look so well too in the pics……. Loving your despatches from the Front, Sue. Not a little awed, too!! Bit different to our usual theatre outings! Loving the blogs – keep them coming!